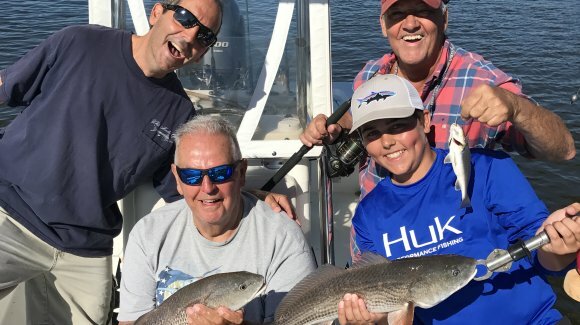 Inshore: Captain Patrick “Smiley” Kelly (843-361-7445) reports that inshore fishing has been good for smaller redfish, trout, and black drum. 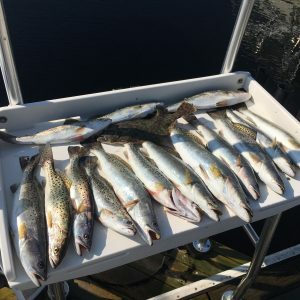 Smaller redfish are eating live and cut menhaden as well as live shrimp, while black drum and trout are mainly eating shrimp. Trout can also be caught on topwater plugs. Off the beaches and in the Little River Inlet bull red drum in the 30-40 inch range continue to be caught on live and cut menhaden. Cherry Grove Pier (843-249-1625) reports that even with the end of the pier closed off catches have still been strong. Strong numbers of redfish, trout and smaller flounder have been caught as a well as some big flounder and a bull red drum (this morning). Whiting and small pompano are also around.